Banerjee has made BJP, particularly Modi, her prime target in the current Lok Sabha elections. Her pitch for elections is BJP Hatao, Desh Bachao, used interchangeably with Modi Hatao, Desh Bachao. The Chessboard Episode 2: How do BJP and Congress manifestos square up? The petite frame of Trinamool Congress chief Mamata Banerjee belies the warrior within as she paces up and down the makeshift platform at campaign rallies likening her challenger Narendra Modi to Adolf Hitler sometimes and labelling him a seasonal bird at times. Hours after Narendra Modi addressed an election meeting in Cooch Behar on Sunday, Banerjee referred to him as a "seasonal bird" for visiting North Bengal only ahead of elections at a rally in the same Lok Sabha constituency. "You had not come to Darjeeling during the days of unrest. Where were the BJP leaders when there were disturbances in the Hills," she threw a poser at Modi. At a Raiganj rally, hours before the first phase, Banerjee called Modi "the king of fascists." "He is the king of fascists. Had Adolf Hitler been alive, he would have committed suicide seeing Modi's activities," she said. Banerjee has made BJP, particularly Modi, her prime target in the current Lok Sabha elections. If her pitch for 2014 elections was Durniti Hatao, Desh Bachao, this time around, it is BJP Hatao, Desh Bachao, used interchangeably with Modi Hatao, Desh Bachao. At the heart of her campaign is a conscious effort to project an alternative to the current government. Political commentator Sabyasachi Basu Ray Chaudhury says, the anti-BJP particularly anti-Modi campaign has gotten a leg-up in the current elections. "The rhetoric, diatribe and the manifesto are all targeted at the BJP." 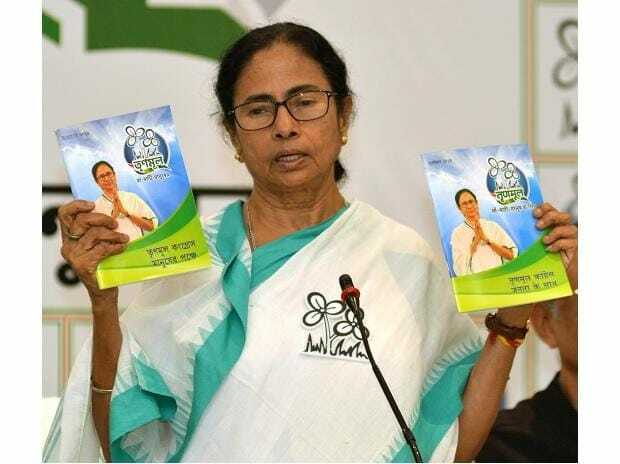 The Trinamool Congress campaign is focused on highlighting how the parameters on which the Modi government has faltered while projecting the achievements of the West Bengal government. In sync with the larger theme, the Trinamool Congress has launched a web series Pradhan Mantri Hisab do that seeks to highlight the ease and the lack of it between state and central schemes. There is also a "Jumla Meter" on the website, which according to the Trinamool Congress provides facts as soon as a claim is made by Modi or Amit Shah in their speeches. Not just in the run-up to the elections, Banerjee has kept national issues simmering since demonetisation. She led a rainbow delegation of Opposition party leaders to the Rashtrapati Bhavan, held rallies in Delhi with state Chief Minister Arvind Kejriwal in tow, created a photo opportunity in Uttar Pradesh with Chief Minister Akhilesh Yadav receiving Banerjee at the airport in her campaign against demonetisation, and quickly became the face of the anti-demonetisation campaign. Political observers and bureaucrats say it's a way to protect her own turf, which is now polarised. The BJP is gaining ground in West Bengal, its vote share having increased from six per cent in 2009 to 17 per cent in the 2014 elections. In the panchayat elections of 2018, BJP - now seen as the only anti-TMC front - finished second. "A loss of seats for the Trinamool in this election will weaken its hold in Bengal which will not augur well before the assembly elections in 2021 even though it's sometime away. Also, it will diminish its chances of playing kingmaker at the Centre in the event of an opportunity," observers pointed out. An attack on the BJP would inevitably revolves around the central government. Banerjee found her ammunition in the CBI fiasco that erupted or when the RBI-government tussle made headlines. Her speeches are often peppered with references on institutions like the CBI and the RBI being muzzled. "From RBI to CBI, everyone is saying bye-bye," is one of her favourite one-liners. At one of the rallies she also said, "He (Narendra Modi) used to be a chaiwala. After five years, he has turned chowkidar. The real chowkidars, who guard the ATMs are not getting salaries. Why are BSNL employees not getting salaries." Whether she has an eye on the top job is not clear but Banerjee believes that she will have decisive say in the formation of the next government. And if she does, the roadmap ahead is chalked out in the manifesto: jobs, education, women empowerment, political, economic, judicial reforms et al.